a great reminder to take your E3Live or BrainON! Each shot glass is 2 oz, top-rack dishwasher safe (although hand washing is recommended to prevent wear or fading). Get your BrainON and Feel Alive with E3Live! E3Live now has shot glasses available for a convenient quick measure of your superfood. What a fun way to remember to take your E3Live or BrainON fresh-frozen algae each day! Choose from four different 2 oz shot glasses in all - described below. 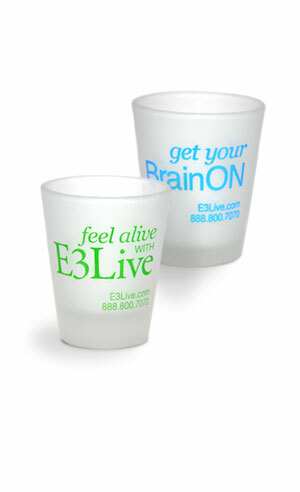 Drink E3Live or BrainON from your beautiful new shot glass every day and "feel the difference!"